I like to design my own unique quilts, but sometimes I suffer "quilter's block" just as I suffer "writer's block" when writing ideas refuse to materialize. I also like to use every scrap I can even though I have plenty of fabric. 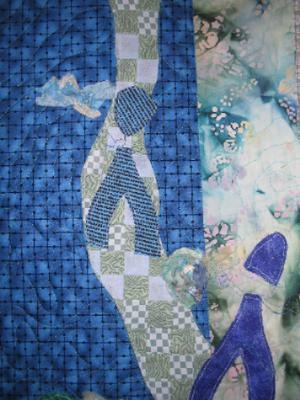 Some of my favorite quilts have resulted from these scraps and loss of ideas. 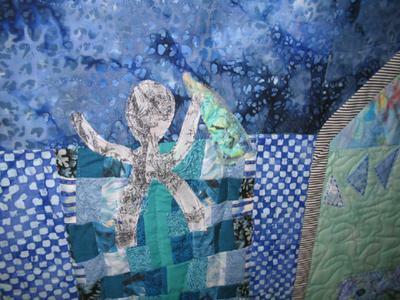 Lastly, these unexpected quilts are usually humorous because it gets my head out of the clouds and helps me make fun of myself rather than taking my quilting too seriously. So here is the result of one of those "blocked" efforts. I call it "Road to Scrap Heaven-No Scrap Left Behind". 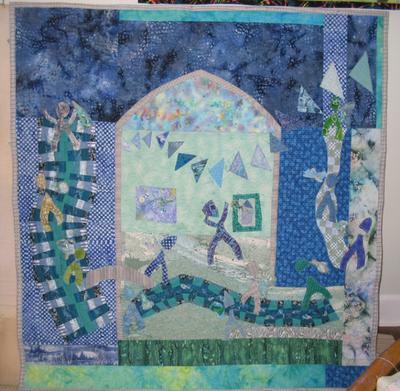 Even the people in the quilt are carrying their bags of scraps to Heaven. :) Flying geese overhead in center and various buttons, scraps, adornments as well. Thanks and hope you enjoy the quilt.